WLC was hired by the Town of Evansville to identify and implement a funding strategy for a new access road to service the Town that cannot be blocked by the BNSF Railroad. The Town of Evansville lies on both the north and the south sides of the BNSF mainline. There are only three access points into the northern portion of Evansville and these are all at grade crossings of the BNSF Railroad. All emergency services and approximately 80% of Evansville residents live north of the rail line. All three of these crossings can be blocked by one train. The need for this project became a priority in 2017 at the same time the State of Wyoming was facing unprecedented funding shortages. As a result, the quantity of state grants typically available to assist in financing these types of projects was significantly reduced. 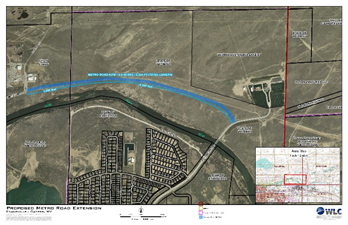 To better accommodate funding availability, WLC developed a phased strategy that would allow construction of a gravel road section of the project. WLC wrote and secured a $500,000 CDBG grant from the Wyoming Business Council on behalf of the Town of Evansville. The Town is currently seeking additional funding for paving of the roadway.